We've recently opened a new website to showcase our custom built-in cabinetry and shelving. 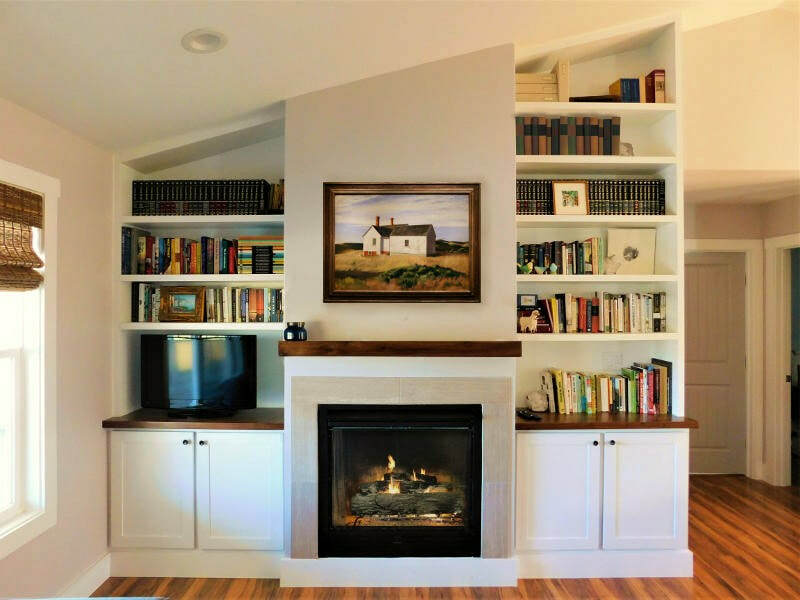 Please visit our sister site, Artisan Built-ins at www.artisanbuiltins.com to learn more... or scroll down for an overview of the services we offer. Every piece of furniture we make is custom crafted to fit your space perfectly. Our goal is to create a stylish storage solution that looks like it was built with your home. 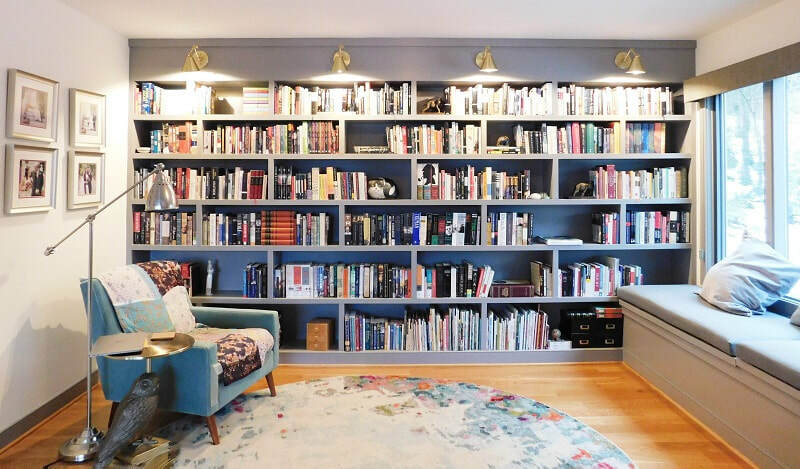 For example, our floor-to-ceiling bookshelves really do go all the way from floor to ceiling and from wall to wall, because we'll measure your room and customize the piece to fit the wall. Another advantage of custom built-in furniture is that you can get it exactly the way you want it, in the perfect color and finish. How do we get all of these details right? First, we consult with you in person so you can explain your vision for the project. This also gives you a chance to get to know us, so you can feel confident that you'll enjoy working with us. Next, we'll provide a scale drawing so you can preview your furniture before we build it. 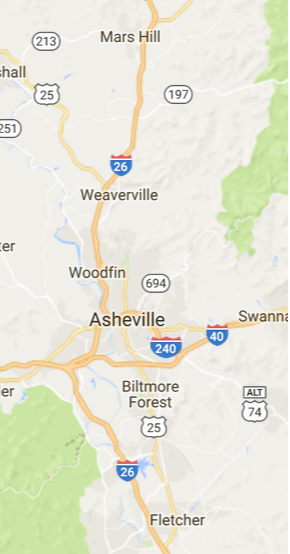 If you like the model, we'll get started at our studio, which is right here in the Asheville area. (Yes, we're totally local!) We do as much work as possible offsite, which minimizes disruption in your home. Once your new furniture is ready, we'll schedule a time to install it. Most installations take less than a day. Plus, every project includes FREE delivery, FREE assembly, and FREE installation, so you can relax and leave the work to us. Click the button to get started today. We're looking forward to hearing from you. 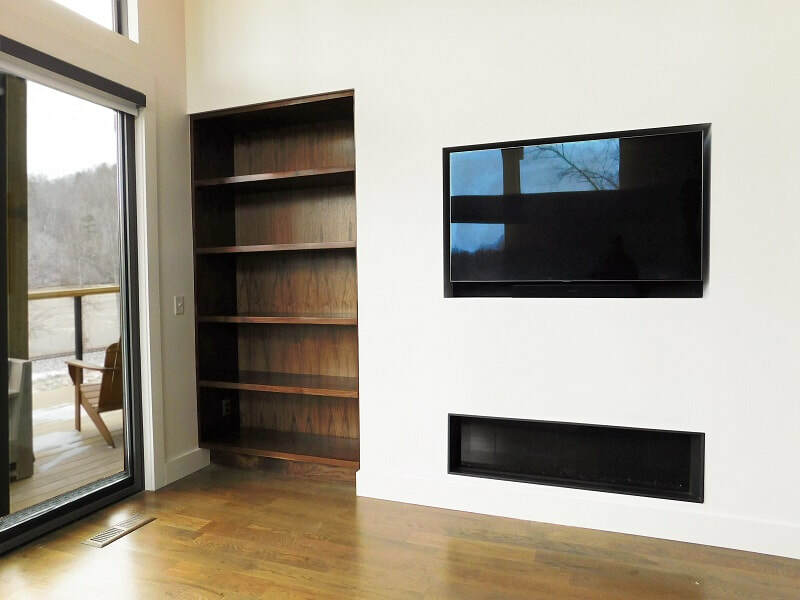 ​See some of the custom built-in furniture we've done in Asheville, NC. This cabinet could go anywhere: in a bedroom as a closet, in a kitchen as a pantry, in an office to hide the modem and printer, or in a living room as an entertainment center. It's built to fit the existing space tightly, as if it was always there, which is ideal in contemporary homes that call for clean lines and perfect integration. 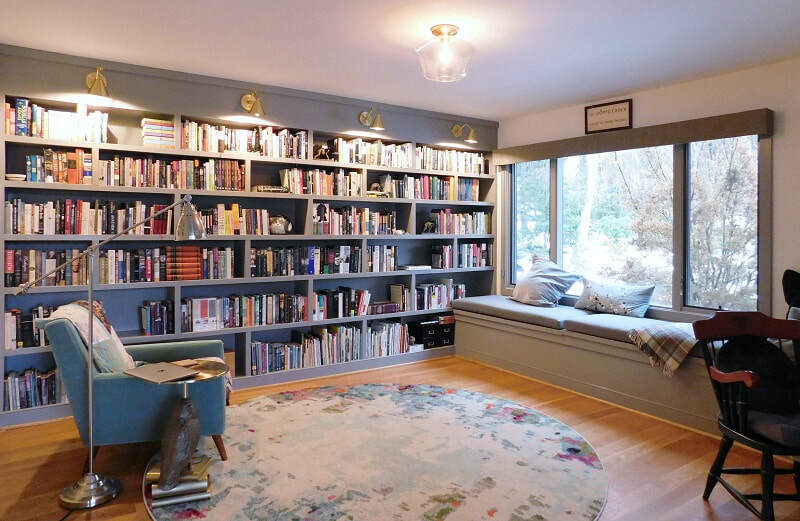 It comes with doors (so you can stash your clutter out of sight) or without (so you can admire your books and cherished possessions every day). This version is made from rich, chocolate-colored walnut wood that plays well against white or gray walls, and the repeating grain patterns bring textural interest into what could otherwise be a boring room. But like all of our products, it could be painted or made in another wood of your choosing, such as cherry, maple, ash, hickory or oak. 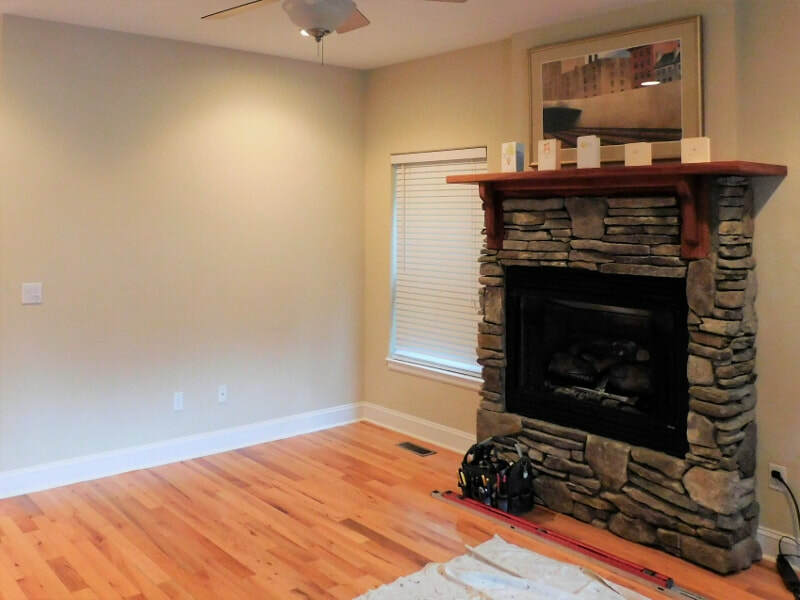 Many homes in Asheville have custom fireplaces in their living rooms. Unfortunately these centerpieces can leave awkward niches that are hard to place furniture around... but custom cabinets or bookcases can be an easy solution to your decorating dilemma. In this example, the shelves really changed the room. The hearth looked bulky and out of place before the installation. Now the new shelving balances it out, and the books bring in a touch of color. 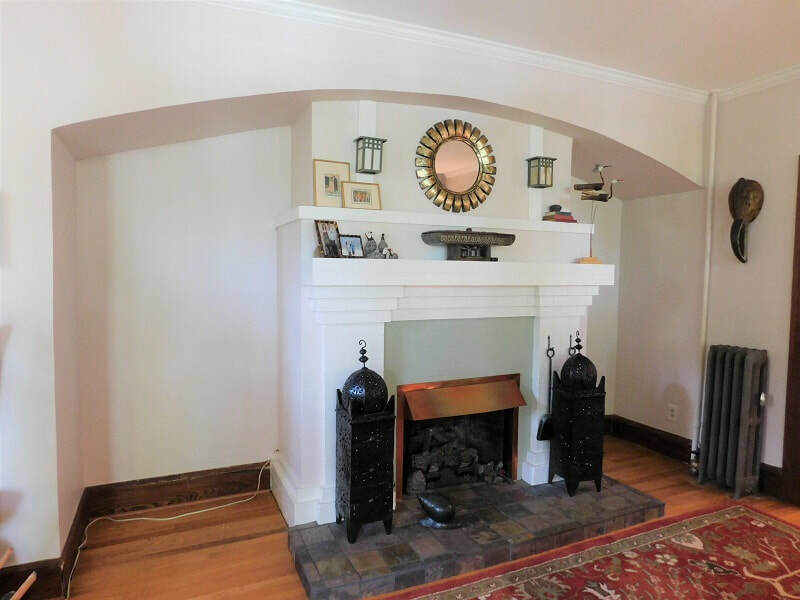 This version is fairly simple, with a one-piece crown molding that echoes the clean lines of the fireplace mantel. The base of the cabinet ties into the baseboard so that it looks like an integral part of the room. 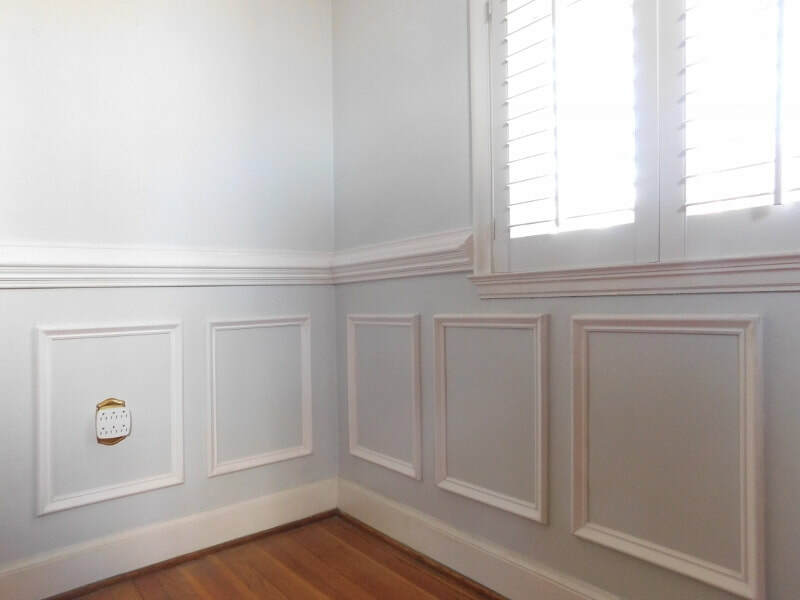 We can also match the shape of your existing crown molding, and paint the unit to match your trim perfectly, so it looks it's always been part of the room. And with our One-Year Warranty, you can rest assured that it's got the potential to last a lifetime. This installation is a great example of the quality we deliver on our built-in furniture. First, notice that the shelves follow the contours of the room perfectly, and go all the way to the ceiling even though it's slanted. You can't tell that this is brand new... it looks like it was built with the house. The counters are made from cabinet-grade walnut plywood, which is often preferred to solid walnut because it's more stable and won't twist or warp. It also has a deep, striated grain that matches the floors beautifully. The cabinets have European-style hinges which can be finely adjusted until the doors hang perfectly straight. The shelves are adjustable, and everything has been painted to match the trim. Since this is a broad span of shelving, each piece is made from a double thickness of plywood to hold up under heavy books. This is another thing that sets our furniture apart from the pre-made pieces you find online: it's made with sturdy materials that will stand up to the test of time. 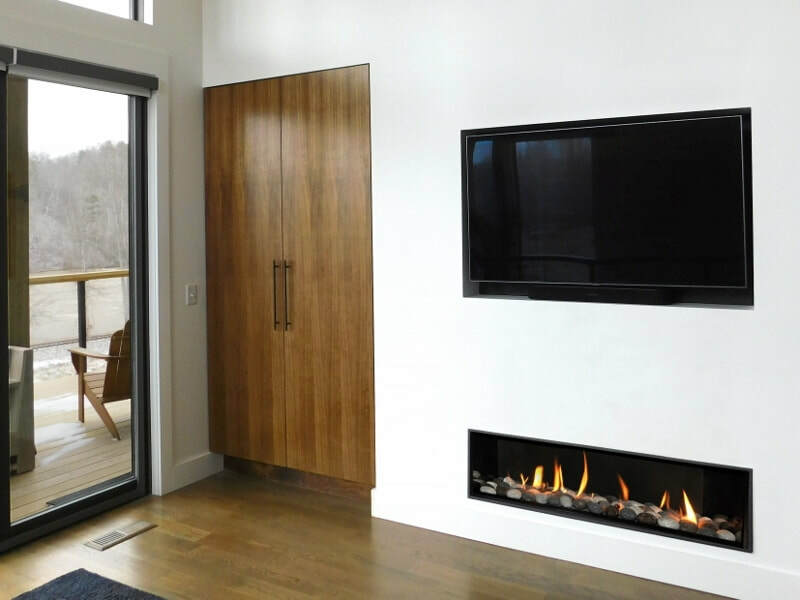 This is another example of a lonely fireplace which needed custom furniture in order to ground it and connect it to the rest of the room. 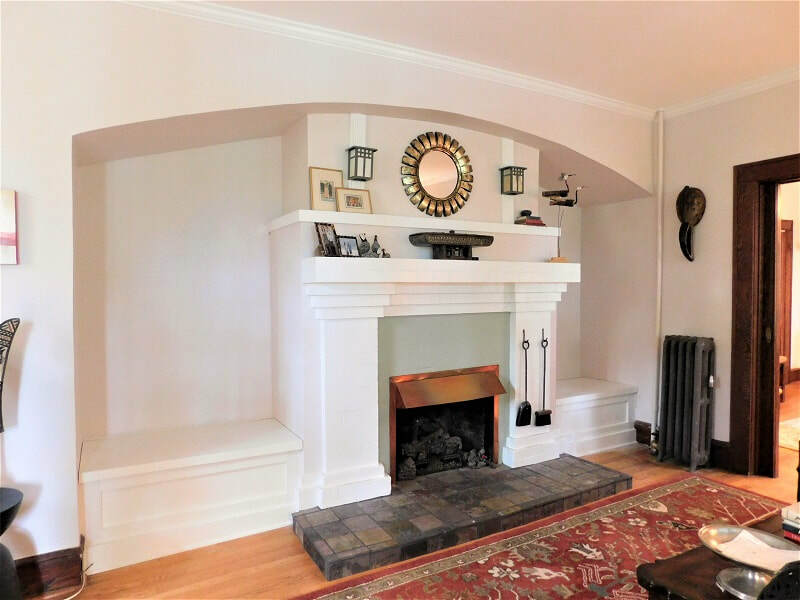 In this case, we were working in a period Craftsman home in Asheville that still had its original brick fireplace set into a traditional inglenook. When the home was first built, the fireplace would have had benches on either side, but these were stripped out by a former owner. This left empty niches on either side of the chimney breast. It looked forlorn. ​Our customer requested built-in benches with flip-top lids for storage. We built them in our studio, then installed them and painted them to match the fireplace. ​Now the fireplace is restored to its former glory, with inviting benches right next to the warm hearth, plus a place to stash extra blankets and cushions so the room stays clutter-free and restful. 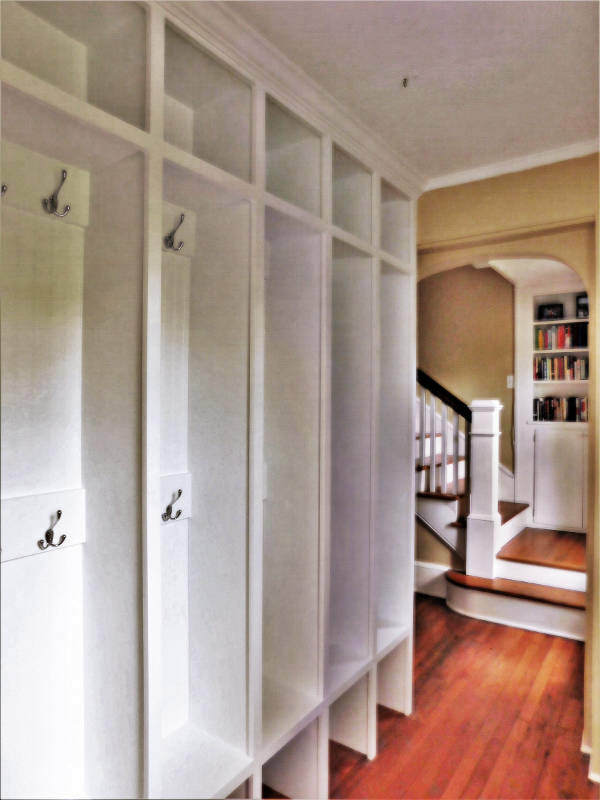 ​These English-style cubbies could have come straight out of a British country home, and they're extremely useful. 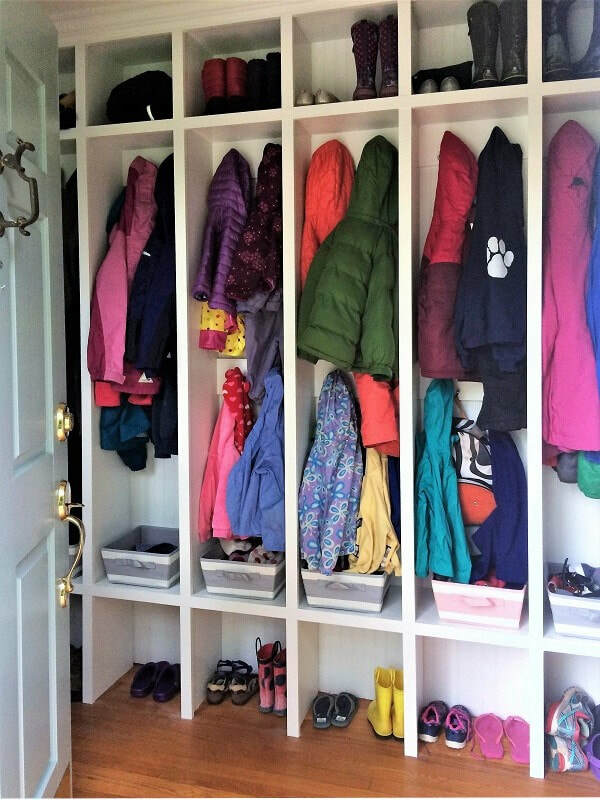 We built them for a family of seven who needed a way to organize all of their coats, hats, galoshes and backpacks. As the kids' mother said, school mornings were "insane" before we installed the cubbies, because she had to find everyone's stuff before she sent them out the door. We worked together to design seven sections so that everyone had an assigned space for their stuff. There were also two levels of hooks so the little kids could still hang up their own coats. Our customer also requested additional shelving at the top for infrequently used items like boots. After we installed them, she sent us a picture of the cubbies in use, and we were happy to see how elegant they still are, even when they're full of coats and hats. It really transforms an otherwise unused foyer into one of the most functional rooms in the home... while bring a welcoming note of style and fun to the foyer. And of course, school mornings run much more smoothly. Notice the beadboard paneling at the back. This is one of those marvelous practical touches that you often see in traditional designs. It continues the formal moldings in the home, it makes the cubbies easy to clean, and it will stand up to heavy use--very important in a household full of kids! ​Wainscot paneling and chair railing is another classic element that's both decorative and useful. It protects the walls at chair level (and kid level) while adding architectural interest. This version was installed in an historic, turn-of-the-century home in North Asheville. Some of the rooms already had wainscot panels, but other rooms were plain, so they asked us to install new chair railing and paneling to match the style of the home. 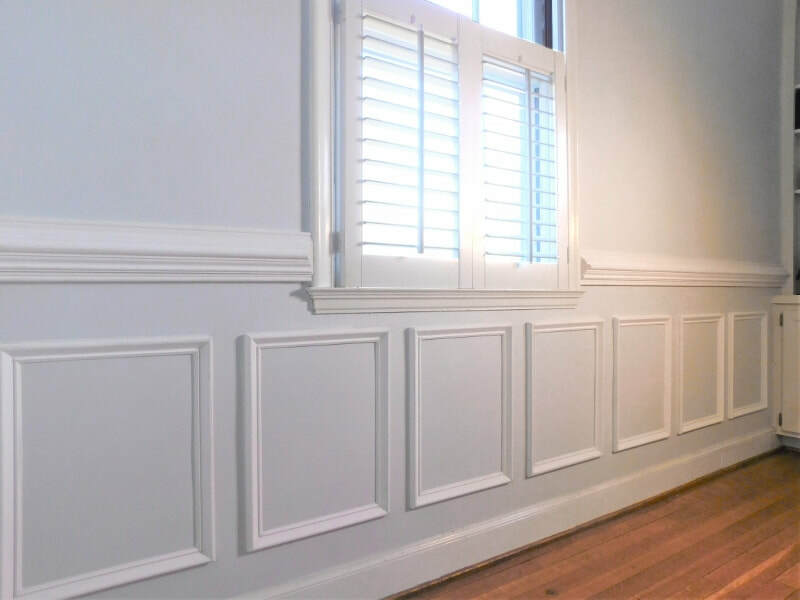 ​We were able to keep costs down by installing pre-made molding directly onto the wall (instead of backing the molding with solid wood panels). The classic style will stand up to the test of time and could add value to the home for generations to come. 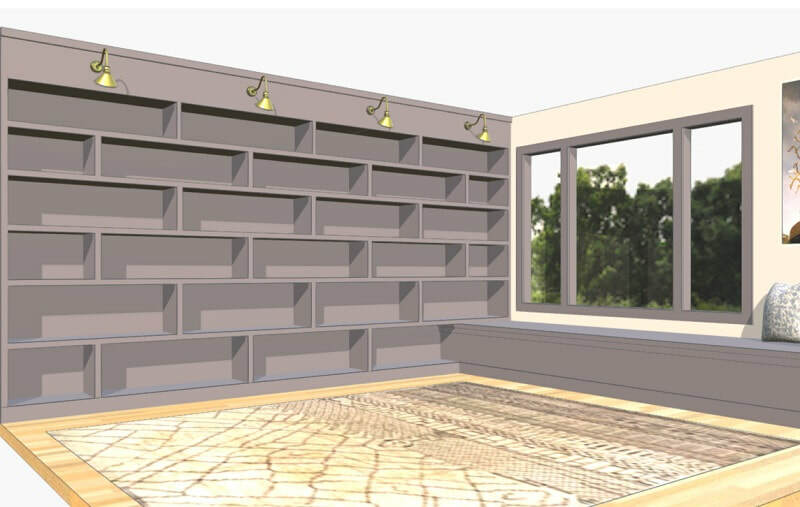 ​​​Don't be fooled by the small picture... these built-in bookshelves are ten feet high and six feet wide! If you look closely, you can see that the shelf sizes are graduated from 14 inches at the bottom to 10 inches at the top. 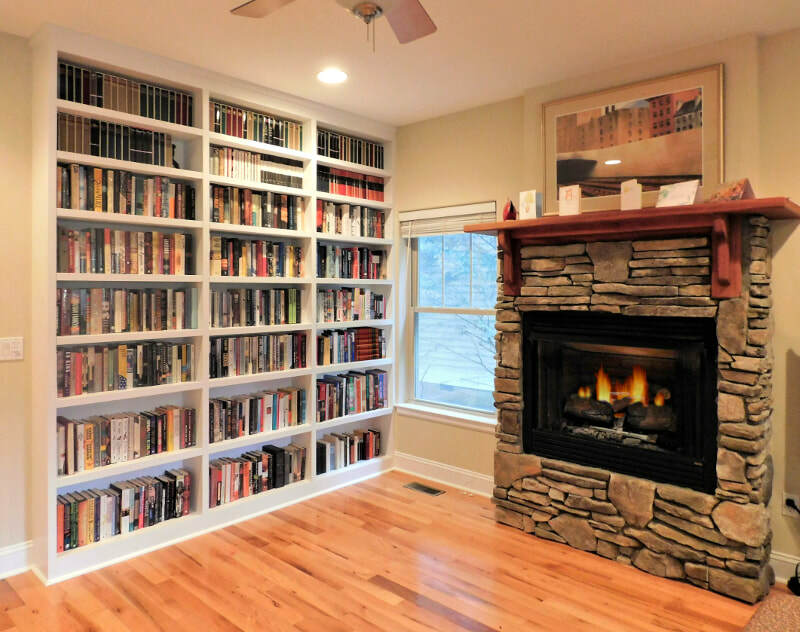 The large openings leave room for the homeowners' tall medical textbooks, while the smaller openings are ideal for paperbacks and ornaments. The other nice thing about graduating the size of the shelves is that it looks "right" on such a large bookcase. It creates a subtle sense of perspective and draws the eye upward, which is nice in a relatively narrow room like this one. We consulted closely with the homeowners on this design. They wanted to avoid the "tic tac toe" look that you get with a standard grid-style bookshelf, so we decided to offset the supports to create an interesting pattern. And of course, as part of our free installation service we secured it tightly up against the wall, which is very important with a unit of this size. That's the personal attention to detail that sets your custom furniture apart from mass-produced pieces. The customer who commissioned this hutch brought us a picture of an "industrial style" kitchen that used black pipe construction for some of the shelving. ​Starting from that inspiration, we worked together to design a hutch with similar construction that would fit into this narrow corner without covering the thermostat and security system. We suggested pairing the metal pipe with thick planks of wormy chestnut which we had recently reclaimed from an old local General Store that a neighbor was remodeling. The desk top is made from a slab of locally-milled oak with a natural, curving edge. 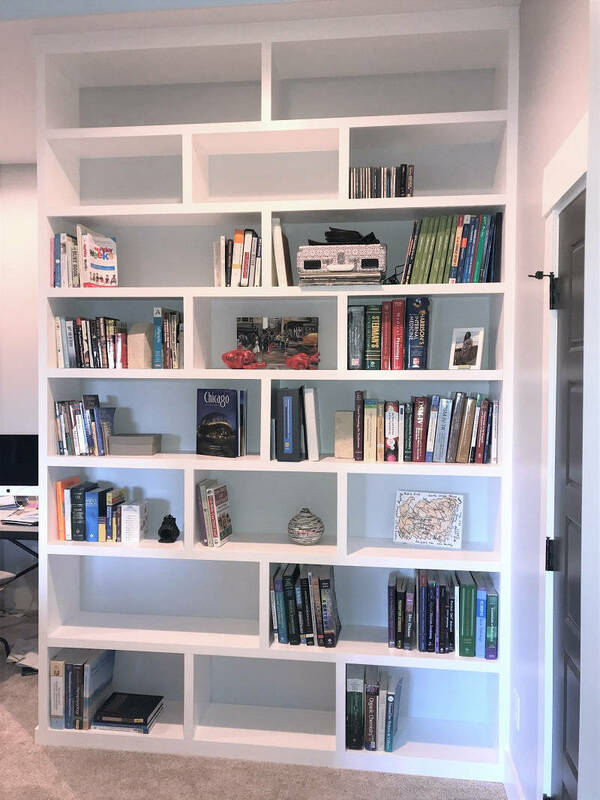 This hutch is another great example of how built-in shelves can turn an unused space into a functional organizational tool. Not only is there extra storage for cookbooks and knick-knacks, but it also serves as a charging station for phones and gadgets. There's a hidden drawer below the desk for even more storage... perfect for hiding your keys and grocery lists so your kitchen stays clutter-free, stress-free, and fun to be in. Want to see more? 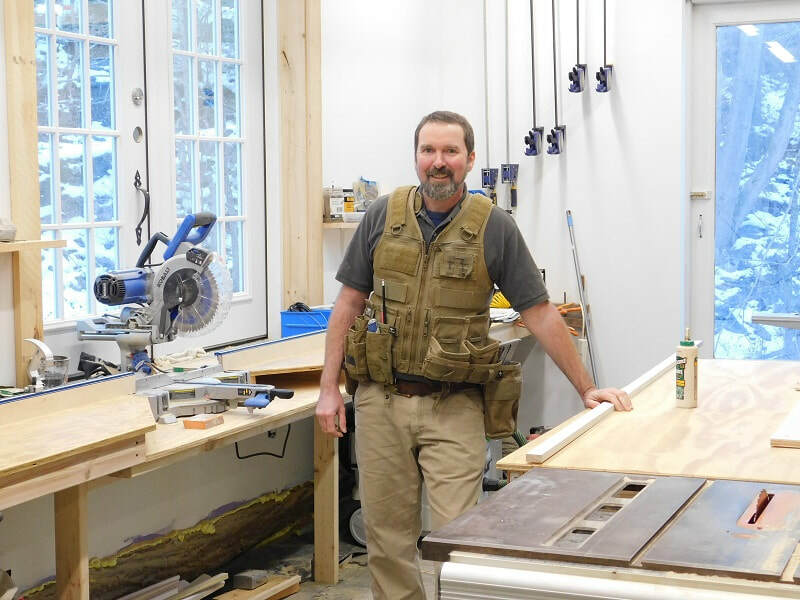 Visit our sister site at www.ArtisanBuiltins.com for our complete portfolio, plus a blog showcasing new projects as we finish them.